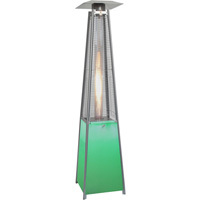 Soak up the outdoor entertainment season with Heat’s selection of pyramid patio heaters. Boasting an unprecedented 42,000 BTUs of propane power, a one-push battery ignition start, and adjustable control, it’s never been simpler to rest in the comfort of a 16.4-ft. heat radius. 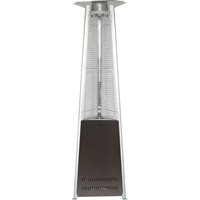 In addition, this model features a stunning, durable pyramid stainless steel-constructed body that suits every aesthetic taste and adverse weather condition. Add an electrifying touch to your outdoor entertainment space with Heat’s multi-color, LED-lit square patio heater. 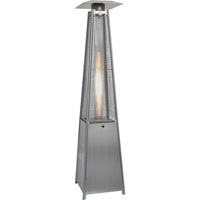 The 7-feet-tall, sturdy stainless steel model emanates both sophistication and an impressive 42,000 BTUs of heat in a 16.4 ft. radius. Also complete with a quick, easy battery-ignition start and low-to-high settings, this heater amplifies the color and comfort at any gathering. 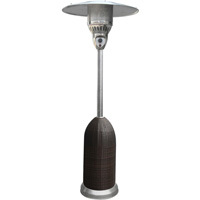 Make the most of any outdoor occasion with the 7-ft. Steel Umbrella heater by Heat. Featuring a construction of superior durability and style, this Hammered Bronze model will remain sturdy and shining after years of elemental exposure. 41,000 BTUs of heat will envelop all guests within a 16.4 ft. radius in unprecedented, comforting warmth, while a variable control valve makes temperature adjustment both fast and simple. 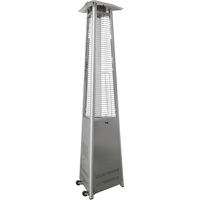 Make the most of any outdoor occasion with the 7-ft. Steel Umbrella heater by Heat. 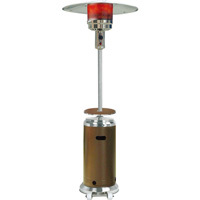 Featuring a construction of superior durability and style, this Bronze/Stainless model will remain sturdy and shining after years of elemental exposure. 41,000 BTUs of heat will envelop all guests within a 16.4 ft. radius in unprecedented, comforting warmth, while a variable control valve makes temperature adjustment both fast and simple. 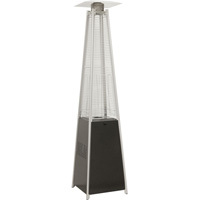 Make the most of any outdoor occasion with the 7-ft. Steel Umbrella heater by Heat. Featuring a construction of superior durability and style, this Stainless model will remain sturdy and shining after years of elemental exposure. 41,000 BTUs of heat will envelop all guests within a 16.4 ft. radius in unprecedented, comforting warmth, while a variable control valve makes temperature adjustment both fast and simple. 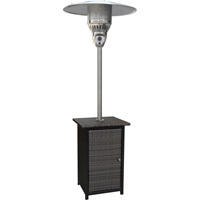 Invite your guests into 41,000 BTUs of comforting warmth with Heat’s 7-ft. round wicker patio heater. Its battery-ignition, low-to-high temperature control and black wicker/stainless finish create a completely custom, stylish outdoor entertaining experience with ease. The 16.4 ft. heat radius seamlessly integrates in with a sturdy, all-steel frame to add top-of-the-line touches of durable practicality. 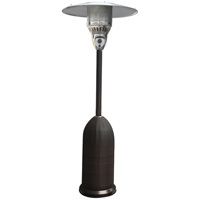 Invite your guests into 41,000 BTUs of comforting warmth with Heat’s 7-ft. round wicker patio heater. Its battery-ignition, low-to-high temperature control and brown wicker/stainless finish create a completely custom, stylish outdoor entertaining experience with ease. The 16.4 ft. heat radius seamlessly integrates in with a sturdy, all-steel frame to add top-of-the-line touches of durable practicality.